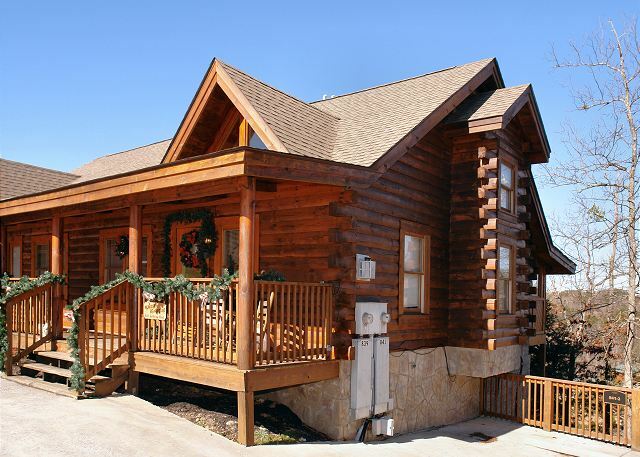 A Fishing Hole is a charming two story, one bedroom custom log cabin with a 1/2 acre Fishing Pond that is catch and release with no license required! VIEW NOW. 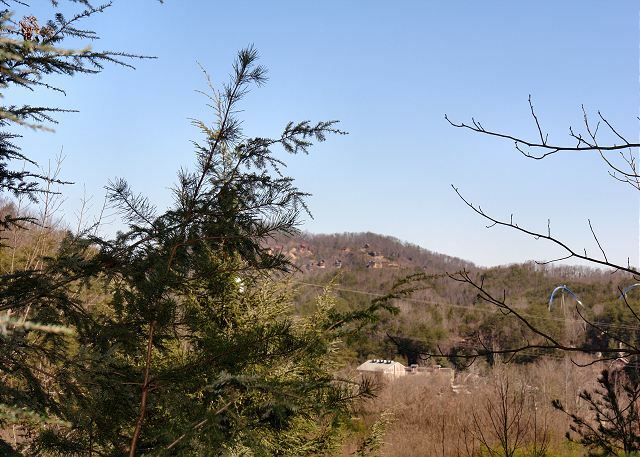 This beautiful 3 level, 2 bedroom, 2 bath log townhome is located just 1 mile from the excitement of Pigeon Forge! With 2 king beds, 1 queen, 2 sleeper sofa/airmattresses and 3 full bathrooms, this home has plenty of room for the whole family. 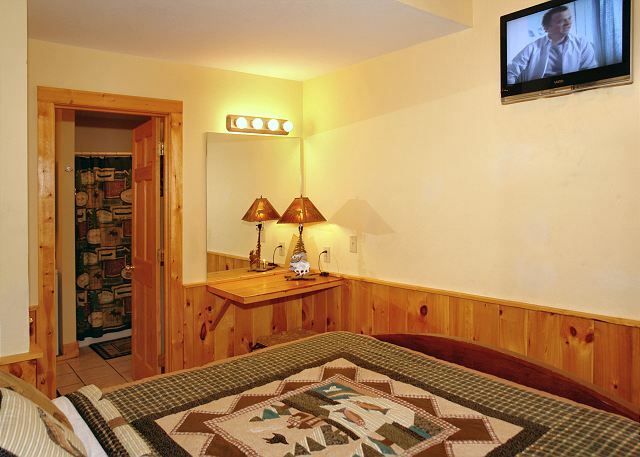 Amenities include pool table, internet access, screened in porch with hot tub, TV & DVD, indoor/outdoor resort pool access, gas grill and washer/dryer. 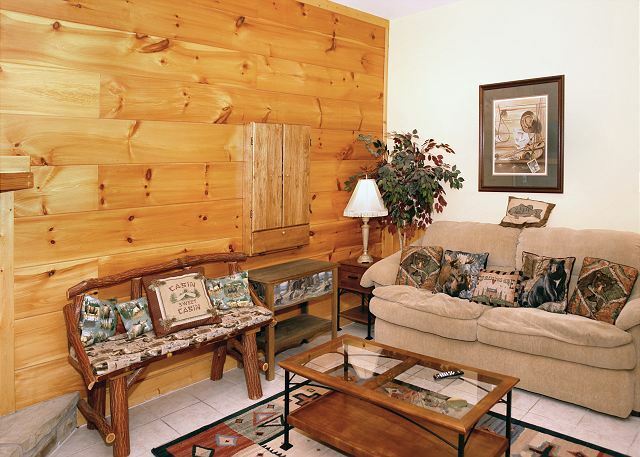 Enjoy some quiet time in the bonus sitting area, or watch TV by the fireplace with the family. Price is based on 4 adults. Each additional adult (12 and up) is $12.50 per person per day. 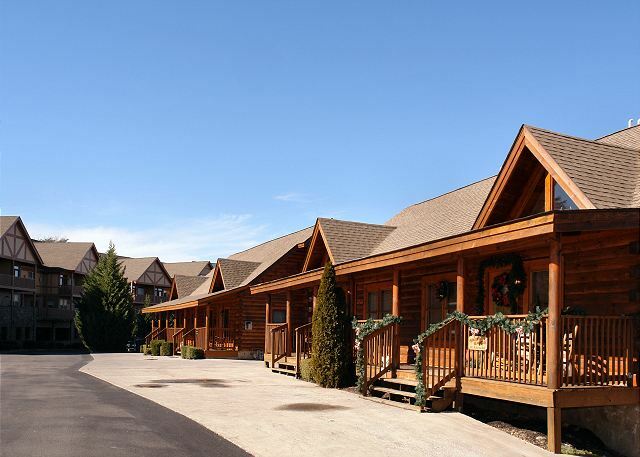 This log townhome has indoor and outdoor pool access, just 1 mile from Dollywood, the Leconte Convention Center, and the Cal Ripken Baseball Experience! Sorry, no pets or smoking. 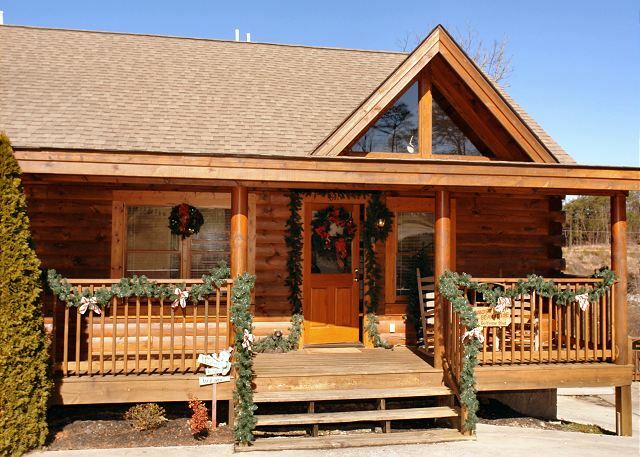 Reserve the ultimate family vacation rental in Pigeon Forge today! There is currently no video for this cabin. Our rental experience with Aunt Bugs was very good. Great location. Clean and comfortable cabin. Had everything we needed. Very professional and courteous service from the staff. Cabin was awesome customer service was outstanding. The cabin was outstanding, location was great. We left an something in the cabin and the staff was great in helping us get that back, even though they didn't have too, because it is plainly in the contract they are not responsible for items left. I will book with them again. Cabin had plenty of room for the whole family. Carpets could be replaced and some of the furniture could be replaced also. But we had an overall great stay and plenty of room for everyone to space out. Wish the hottub was in a room where you could open the windows. Our family if 5 enjoyed our stay here. It was decorated nice, plenty of room, plenty to do, and great location. Could use updating some. Our vacation rental was great! The people were very friendly and loved the cabin and Aunt Bugs service. We were very pleased with the cabin. The people at Aunt Bugs were very helpful and friendly. The cabin was clean and ready on time. Everything we needed to cook with, sleep well, play pool, and swim on site. The only thing I think needs to be done is to cut the tree at the right side of the cabin which blocks the nightly fire works from being seen at Dolly Wood from the back decks. Location is great and you feel secured. This was our 4th. stay WE will be back. Notify us when you cut the tree so the grand kids can view the fire works. There were four in our party all adults and seniors as well. The location of the cabin couldn't have been better for us a mile from the main strip. The cabin was clean and large and we had fun with the pool table and the hot tub. The staff was friendly and very helpful. They responded quickly to any question or request that we had. We will definitely stay there again if we are going back to Pigeon Forge. Thank you for a wonderful week. We enjoyed staying at Almost Bearadise - the location was perfect! The cabin was very roomy, and worked great for us!! We stayed in Almost Bearadise with our daughter and her family. There was plenty of room for everyone to have privacy. The boys enjoyed the upstairs pool table and bedroom area, while the adults and younger children had plenty of room on the main floor and basement suite. Cabin was very clean and well-maintained. Loved the close location to all the restaurants and shops of Pigeon Forge. It was alright and I really enjoy the cabin. Very nice place. 2nd time in the same unit. Pool was very clean at all times. Cabin is beautiful but still has a homey feel. We had two families vacationing together (9 people total). This cabin was perfect! 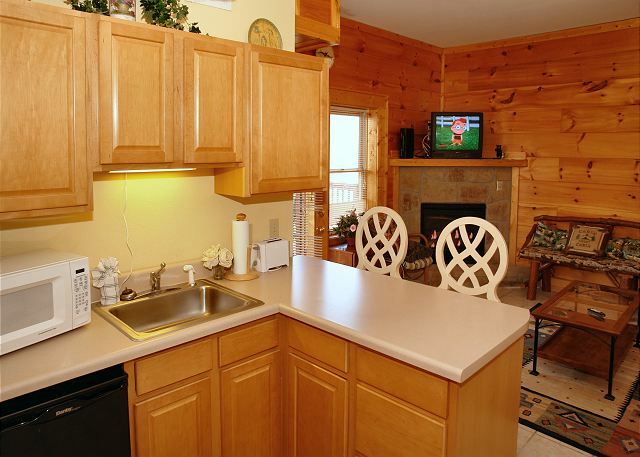 Clean, we'll furnished, plenty of space, very close to Pigeon Forge. We would definitely rent here again. Great rental. Enjoyed nearly aspect of the facilities. TVs were a little dated, but really, we didn't get away to watch tv. Very spacious, great set up for our family (6,4,and 1 yr old). Only draw back to mention was the lack of ventilation in the room with the hot tub (creates a smell - one openable window, or a fan vent would fix that. Great location. 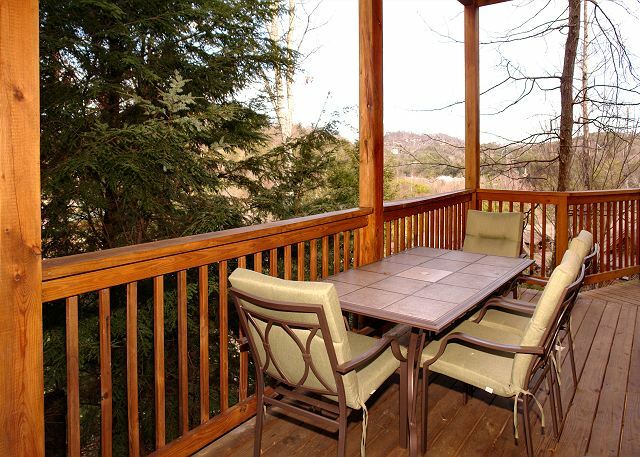 Close to Dollywood and the parkway.cabin had lots of room and was in good condition. The cabin was wonderful and very relaxing. We enjoyed the area and will vacation there again. Excellent - very relaxing and clean. We were delighted with the space inside the cabin, the accommodations were beyond our expectations. The hot tub was glorious! There were 4 people in our group. My grandson really liked his loft room. The cabin was neat and clean; very well laid out. Great location close to town for the grandkids. Three separate living areas worked out very well. This 3 level cabin was great. There was a bedroom on the main level with entrance directly behind the door as you go in. There was a sleeper sofa on the main level with shared bathroom with the bedroom- Jack and Jill style. The combo washer/dryer was on the main level, in the bathroom. There was a queen side bed on the third level with a small balcony with a view of one of the rides at Dollywood (overgrowth from tree slightly blocking the view). The third level bedroom wasn't very private, no door, pool table was on that level, was overlooking the main living area. The bedroom on the bottom level was setup with a small kitchenette, separate living area, bathroom and a shared deck(as townhouse) with the gas grill on this deck. There was a separate entry to the bottom level as well which has a stairway on the right side of the townhouse where the parking area was. The only thing I didn't exactly like about the townhouse was the fact that the hot tub was enclosed inside of a room on the main level of the cabin. We typically love the hot tubs available, but we never used this one. It was like a sauna just opening the door to walk into the room where the hot tub was located. There were windows to where you could look on(note that the hot tub was on the back side of the cabin and you would have privacy if utilizing the hot tub, which would not allow your neighbors to see you. The entryway to the hot tub was in the dining area and did have the door was previously mentioned. The door was a glass door that you could see through. Our stay was very nice. 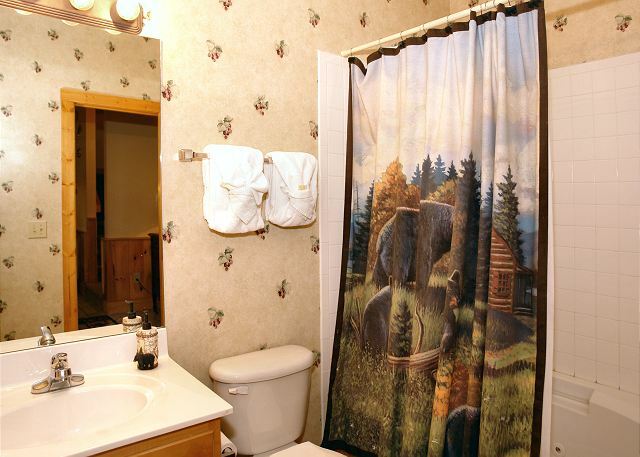 The cabin could use a deeper cleaning and the downstairs bath tub did not drain well so we stopped using it. Other than that we had a very nice time. This cabin was in an excellent location. It was very convenient to all of our activities. Enjoyed our stay very much. We plan to stay here again. We enjoyed the stay there, just enough room for the 6 of us. The cabin was even more than I expected. However, when I arrived at the cabin, I used the combination lock to access the door key and replaced it immediately in the lockbox as the instructions indicated. Problem with that was that there was not a key on the counter (as the note indicated) for my use. I contacted the office and was told that the cleaning crew probably had the key. They said I could come to the office to pick it up. I did not have time to do this so I continued to use the combination lockbox to access the key during my stay. This was quite an inconvience at night. From a customer service standpoint, I feel that someone should have delivered another key the cabin. Afterall, the point of leaving a key in the lockbox was so that the management could access the cabin 24/7. Had I not have followed those rules, I would have been fined $100. I feel that I was not accomodated properly. I do realize that this is hopefully an isolated incident and would rent again. 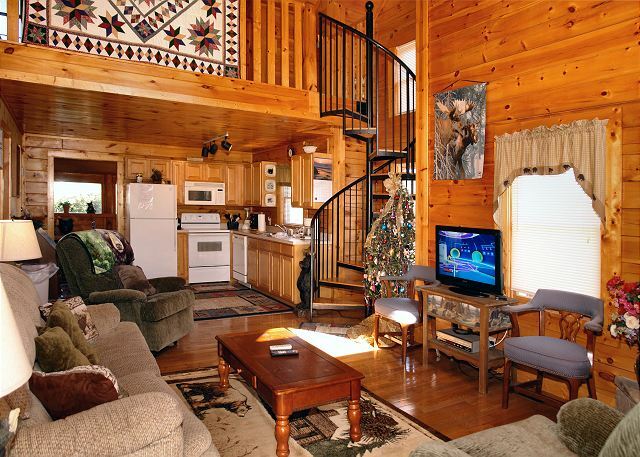 The layout of the cabin was perfect for our family. We enjoyed our stay. Our only complaint is the tub in the downstairs bathroom was filthy! We were very comfortable and the cabin was nice. There was a leak in the ceiling and I sent a couple of messages about it and never heard back. But the cabin overall was nice. 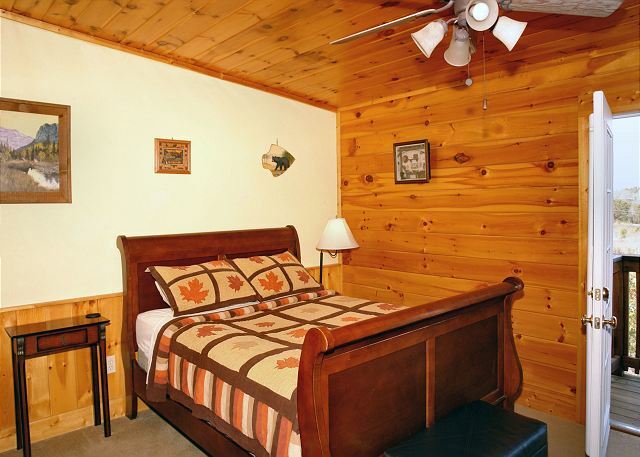 Beautiful cabin, nice folks, cabin needed cleaning and nee carpet in the main bedroom and a few other repairs for guests. The rug has a corner that we kept tripping over. 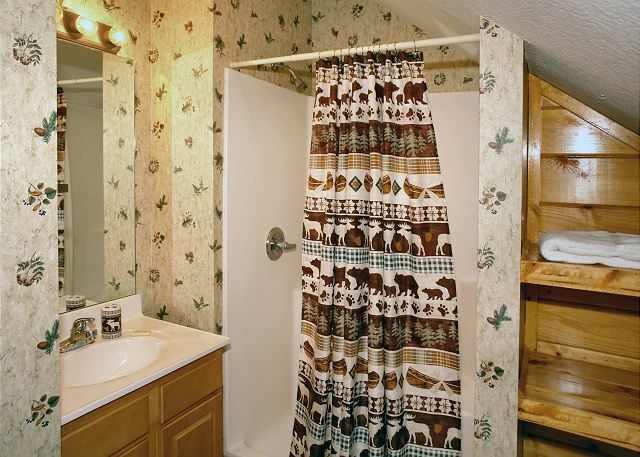 Main floor bathroom needs pairing , especially over shower head. The cabin was big enough for all of us 8 people. Wish the kitchen had measuring cups (more than the 1/4 cup) and a better can opener. Wish the TV's were bigger and had DVD players not VHS tapes. I think the couches need to be replaced - the basement couch had rips in the cushions and you could see the stuffing. Loved the facility - indoor and outdoor pool great. Good location. We thoroughly pleased with our cabin and our dealings with Aunt Bug. Hopefully we will get back that way and will be contacting you again. Couldn't have ask for a better location. Thank you for making our stay so pleasant. Very well kept. Plenty of room for a small group to stay. Wonderful staff. Aunt Bug's customer service was great but the cabin was not. I will book through you all again but it will be a different cabin. 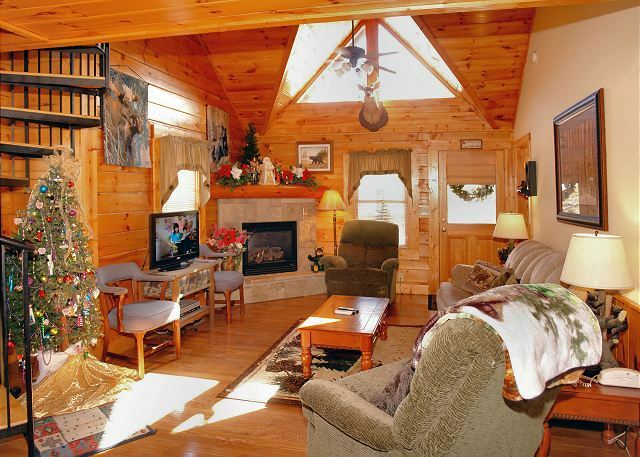 Great cabin with all the amenities! We had a wonderful family reunion with enough space for 3 families. Staff was kind and accommodating. We have stayed with aunt bugs several times. Over all its been good every time. Looking forward to the next time. The service was very good. Was very pleased with everything. 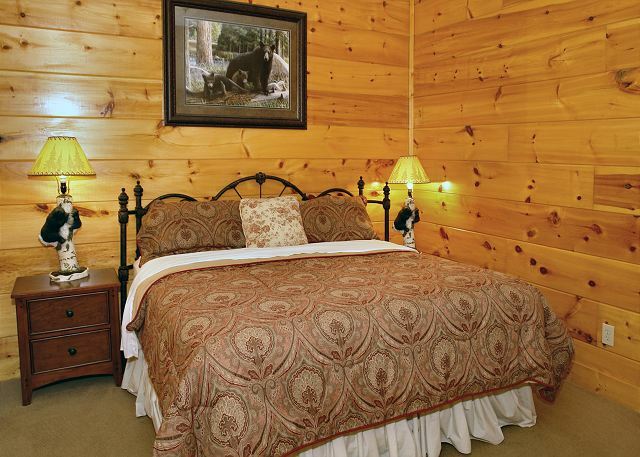 The cabin was wonderful; it might be nice to have a fan in the basement bedroom. We had a family of seven and there was plenty of room for us all. The whole family was extremely pleased thrilled with the size, location and cleanliness of our cabin. It made our weekend getaway a very enjoyable experience! Thank you Aunt Bug's Cabins . We scheduled a trip with grandkids at the last minute, the staff was very friendly and helpful. The cabin was very clean. Everyone in our party had plenty of personal room. My grandson especially liked the balcony room! This is the 2nd time that I have stayed at this cabin and I enjoyed both times. I would love to stay again when we come back to pigeon forge. Select your Arrive Date and Depart Date above.